In this essay Tom Gates examines many of the factors affecting the relationship between the Seeker and the Meeting, before and during membership. 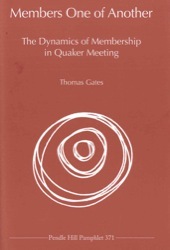 While a person may be drawn to Quakerism for a particular reason, over time the individual’s needs, and the way in which the Meeting community is able to meet them, can change. There are stages to be gone through as we grow into the life of the meeting community. Is it peace we are after? Service? Shared values? A deepening of our faith? What, exactly, is a leading? Tom Gates examines the many aspects of membership and the obligations it may impose on us, individually and as a faith family. Tom Gates is a graduate of Williams College and Harvard Medical School. After residency training at the University of Utah, he spent eight years as a family practitioner in Lancaster, New Hampshire (population 3000). In 1991, he and his wife Elizabeth, along with their sons Matthew and Nathan, followed God’s leading to Friends Lugulu Hospital in rural western Kenya, where they lived and worked among Kenyan Quakers for three years. Upon their return in 1994, Tom spent a year as a student at Earlham School of Religion, where he enthusiastically pursued interests in Quaker history, Bible studies, theology and ethics. Since 1995, he has been a member of the clinical faculty of the family practice residency at Lancaster, Pennsylvania, General Hospital, where among other things he teaches medical ethics, coordinates resident electives in international health and practices in an underserved minority community. In 1997, the Gates family returned to Lugulu for two months, to renew friendships and fill in at the hospital. Tom Gates is a member of Lancaster Monthly Meeting, where he has served as an Overseer and convener of the Worship and Ministry Committee.